President Johnson signed more national park legislation than any other chief executive in history—47 new park units were established and 23 were expanded. For that reason, it is very appropriate that Lyndon B. Johnson National Historical Park is the setting for numerous special events throughout the centennial year. Aroma from The Salt Lick BBQ’s rotisserie will fill the oak grove on May 7 and the music of Jake Penrod and his Million Dollar Cowboys will keep guests dancing well into the evening. The night of entertainment and delicious barbecue will also be a celebration of the National Park Service’s centennial year. Park guests will be able to experience a Fort Griffin Fandangle show very similar to the program that President and Mrs. Johnson first presented at their ranch in 1967 for ambassadors from Central and South American countries. 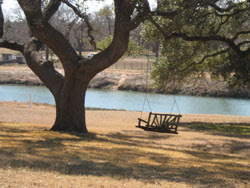 The event on May 7 will be the fourth time a “Fandangle Sampler” has been staged at the LBJ Ranch—previous events were held in 1967, 1976, and 2008. Each summer for more than seven decades the citizens of Albany, Texas have presented the Fandangle, the oldest outdoor musical program in Texas. It is theatrical history that is written, directed, and performed by hundreds of members of the Albany community. Through singing, dancing, and story-telling the Fandangle recaptures the history, folklore, and legend of the Old West. Information and reservations are available at www.FriendsofLBJNationalPark.org . Reservations are $50 for adults, $15 for children 12 years and under.